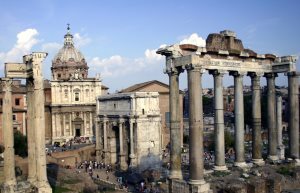 According to tradition Rome was founded on the 21st of April, 753 b.C. ; actually it spread little by little. In fact the first hill to be occupied was the Palatine, where in the tenth century a Latin colony settled on the side, which overlooks the Tiber. Here the Tiber is divided into two by the Tiberine-isle, an obligatory point of passage not only for the north-south trade, but also for the goods coming up from the sea to Lazio and Central Italy. The most ancient ruins found on the Palatine prove the existence of a village surrounded by an embankment. The traditional Roman "Square". Some time later the development of trade boosted the creation of trade centres for all imported and exported goods. During the Era of the Kings, Rome had gained the supremacy of Lazio. It was the strongest bulwark against the attempts of nearby populations (Etruscans, Equi and Volscians) to invade the Tiber valley. They tried to pass the borders attracted by the fertile plain. Its strength allowed Rome to organize a Latin league, made up by several Latin towns under the lead of Rome. So town by town, Rome first conquered Italy, than spread through the Mediterranean area reaching the Euphrates on the east and Britain on the north. After the unification of Italy, The Romans prepared the conquest of the Mediterranean. This was a further step to the creation of the Roman system, that was carried out with a succession of wars which lasted about three hundred years, from 264 bc to 44 ad. With its victories Rome, had conquered many territories and acquired great riches. This prosperity caused strife rather then peace among the Romans themselves. They soon realized that wealth was not equally divided, and for this reason the fighting between two opposing parties became a civil war. The change from a kingdom to an empire was gradual. However, since Tiberius, the word "emperor" had a new meaning and became a synonym for "king". The change would take place with the following Emperors, until the transformation of the Empire in a real "dominion" were the king is master of his people. Ottaviano Augustus was the first to have the title of emperor. When he was about to die, he wanted to appoint a successor. He could not officially do so because in theory the republic still existed; therefore he did it practically by adopting his step-son Tiberius so that after the death of Augustus, Tiberius was elected Emperor by the Senate and the Roman people. With August started the Giuli-Claudi dynasty which ruled from 30b.C to 68 a.D. After the extinction of the Julius Claudius dynasty many emperors followed without leaving any trace in history, others instead must be remembered for their contribution to the development of Roman civilization. The emperors of the Flavin dynasty are among those and they ruled from 69 to 96 a.C. With the Antonini, so called because of Antonio Piu, the Empire reached its highest degree of good government. Nerva, the first member of the dynasty, introduced that which was called succession by adoption. With Marcus Aurelius the system of adoptions ended, in fact he restored the dynastic succession appointing his son Commodus as his successor. From the death of Commodus to Diocletian one hundred years elapsed, during this period there was a serious crisis, caused by the fact that emperors were elected very easily: 25 emperors in this period. Among those emperors we recall Caracalla famous for the baths and his edict (212) with which he bestowed the citizenship on all the inhabitants of the Empire; Aurelian who restored peace in an Empire tormented by continuous wars, and at the end Diocletian, Constantine and Theodosius, who ruled before the decay of the empire.